Absolutely nothing. This may shock you, but, as every honest Trinitarian will admit, the word “Trinity’ is nowhere in Scripture. Neither are the curious terms, “God the Son” nor “three-in-one” nor “all God and all man,” nor any of the other extra-biblical terminology that Trinitarian theologians use in their convoluted and desperate defense of this inconceivable doctrine. No honest Trinitarian scholar will say that he can either understand or explain the Trinity. How then can it be “the cornerstone of the Christian faith”? Theology professor Louis Berkhof states: “The Church confesses the Trinity to be a mystery beyond the comprehension of man. The Trinity is a mystery, not merely in the biblical sense of what is a truth, which was formerly hidden but is now revealed; but in the sense that man cannot comprehend it and make it intelligible” (Systematic Theology, 1996, p. 89). What about 1 Peter 3:15, where the Apostle Peter instructs us that we are to “always be ready to give a defense to everyone who asks you a reason for the hope that is in you”? How can we reconcile that with belief in a doctrine that many theologians admit is, as The Encyclopedia Americana puts it, “beyond the grasp of human reason”? (1980, Vol. 27, “The Trinity”). Cyril Richardson, professor of church history at New York’s Union Theological Seminary, though a dedicated Trinitarian himself, said this in his book The Doctrine of The Trinity: “My conclusion, then, about the doctrine of the Trinity is that it is an artificial construct…It produces confusion rather than clarification; and while the problems with which it deals are real ones, the solutions it offers are not illuminating. It has posed for many Christians dark and mysterious statements, which are ultimately meaningless, because it does not sufficiently discriminate in its use of terms” (1958, pp. 148 and 149). He also admitted, “Much of the defense of the Trinity as a ‘revealed’ doctrine, is really an evasion of the objections that can be brought against it” (p. 16). Millard Erickson, research professor of theology at Southwestern Baptist Theological Seminary, writes that the Trinity “is not clearly or explicitly taught anywhere in Scripture, yet it is widely regarded as a central doctrine, indispensable to the Christian faith. In this regard, it goes contrary to what is virtually an axiom of biblical doctrine, namely, that there is a direct correlation between the scriptural clarity of a doctrine and its cruciality to the faith and life of the church. “In view of the difficulty of the subject and the great amount of effort expended to maintain this doctrine, we may well ask ourselves what might justify all this trouble” (God in Three Persons: A Contemporary Interpretation of the Trinity, 1995, p. 12). Professor Erickson later points out: “It is claimed that the doctrine of the Trinity is a very important, crucial, and even basic doctrine. If that is indeed the case, should it not be somewhere more clearly, directly, and explicitly stated in the Bible? If this is the doctrine that especially constitutes Christianity’s uniqueness…how can it be only implied in the biblical revelation?…For here is a seemingly crucial matter where the Scriptures do not speak loudly and clearly. “Little direct response can be made to this charge. It is unlikely that any text of Scripture can be shown to teach the doctrine of the Trinity in a clear, direct, and unmistakable fashion” (pp. 108 and 109). The above quotes are from Is God A Trinity? a booklet published in 2011 by the United Church of God. To read any theologian’s “explanation” of the Trinity is to be transported to realms where words, shorn at last of their semantic burdens, pirouette and regroup in combinations hitherto undreamed of. In other words, it is pure gobbledygook. 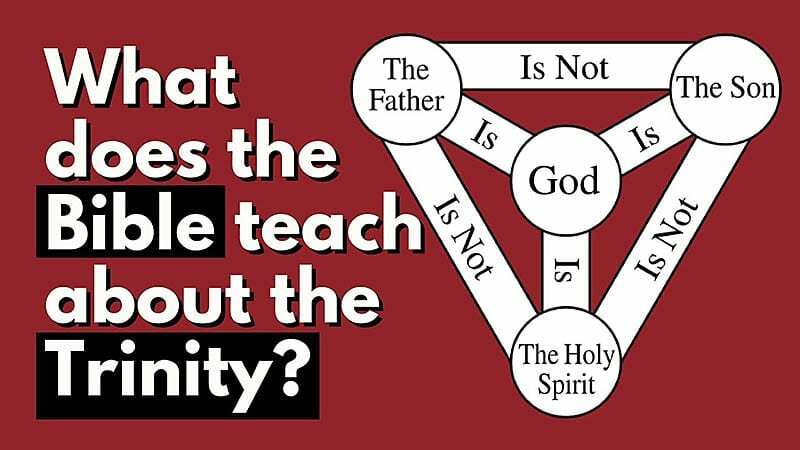 The only way anyone can believe in the theology of the Trinity is by suspending any appeal to reason, logic, or linguistic principles, because it is absolute nonsense. On the accompanying video for this question, I read the definition of the “Trinity” from the New Bible Dictionary. Take a look and see if you have any idea what they are talking about? So if there is no such thing in the Bible, why do most Christians believe in the Trinity? Historical research provides the answer to that question, which begins in ancient Babylon and winds through Greece and Rome until it is formally hammered out in the 5th century A.D. by the Roman Catholic Church and then enforced at the point of a sword for 1000 years. All honest Trinitarians will agree that it is a theological construction rather than something clearly stated in Scripture. 1 Corinthians 8:6 tells us that for Christians “…there is one God, the Father…and one Lord, Jesus Christ…” That simple math (1+1=2) permeates God’s Book (cp. Ps. 2:2; John 17:3; Eph. 1:2; 1 Tim. 2:5) all the way to its last chapter, where we see in Revelation 22:3 that when all is said and done, there will be TWO SEATS on the final throne, one for God and one for “the Lamb,” Jesus. 2 Corinthians 4:3 and 4 tells us that the Devil’s goal is to obscure, distort, and diminish Jesus Christ. Although most Christians sincerely believe that Jesus is “God the Son” because they have been told it elevates him, this grievous untruth actually diminishes the Son of God and the magnitude of his heroism on our behalf. Think about it: if Jesus is God, why is what he did at all impressive? What he did, first by living a sinless life despite endless temptations by Satan, and then by enduring 40 hours of torture before being nailed to a tree and hanging there in agony for six hours while holding the Word in his mind and forgiving his tormentors, is no big deal for God, is it? But what about a human being doing that?! And then telling us that we can be like him?! That’s impressive, don’t you think? Jesus Christ accomplished what he did by completely trusting His Father, God, and subordinating his will to the will of his Father. Though he had many opportunities to say that he was God in human flesh, he never did. In fact, when he was falsely accused of making himself equal with God, he asserted his total dependence upon God and stated that he was the SON of God (e.g., John 5:16–30, 10:24–39). Our nearly-700-page book, “One God & One Lord: Reconsidering the Cornerstone of the Christian Faith,” leaves no stone unturned in expositing this crucial topic from every angle, including historically. Jesus’ question to his disciples, “…Who do men say that I am?” is one that every person on earth must answer. Our book “The Gift of Holy Spirit: The Power To Be Like Christ,” in chapter one. We have an article: “What is the Trinity?” but it is only the tip of the iceberg, under our Topic section: What About The Trinity we have many more articles on this subject. There is also an audio teaching: “In Your Face” October 2012 broadcast on The Trinity,” and available free on our website the booklets: “34 Reasons Why the Holy Spirit is Not a Separate “Person” From the Only True God, The Father;” and “47 Reasons Why our Heavenly Father has no Equals or “Co-Equals.” We also have a video teaching: “Batman and Robin Discuss Who is the REAL Dynamic Duo,” and our class: “One Day With The Creator,” Segment 24.